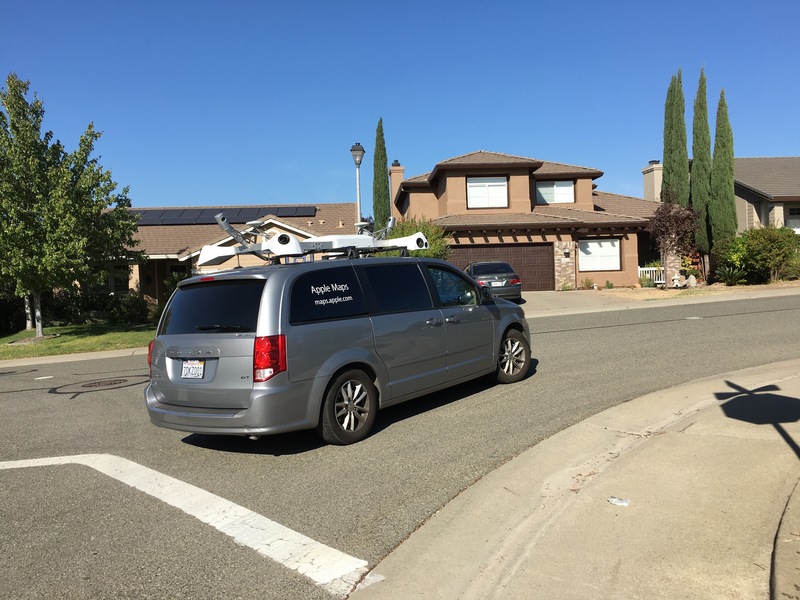 Just spotted the Apple Maps “street view” van cruising our neighborhood in Rocklin, CA. 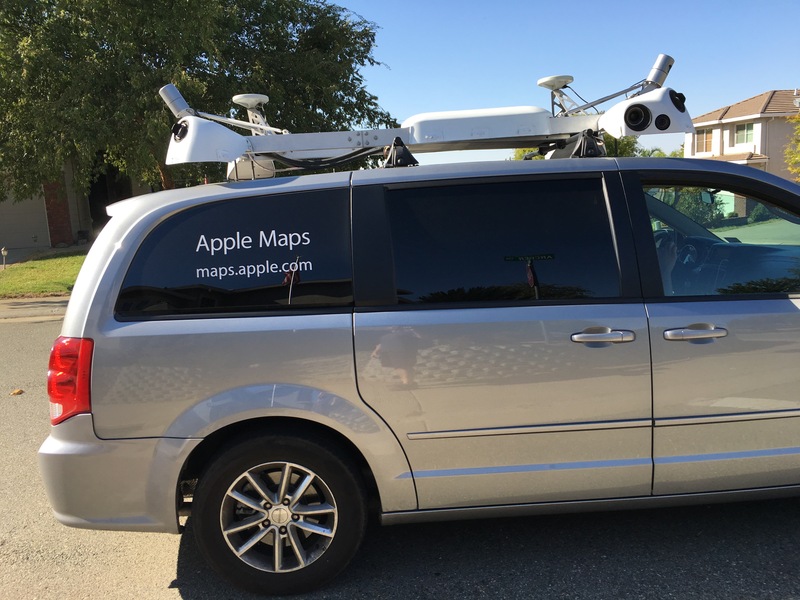 Looking forward to soon have street view integration in Apple Maps! This entry was posted in news and tagged apple, applemaps, maps, streetview. Apple’s Fall event is rumored for Sept 9th. It should be pretty standard: iPhone 6s, iPhone 6s Plus, iOS 9, OS X El Capitan. 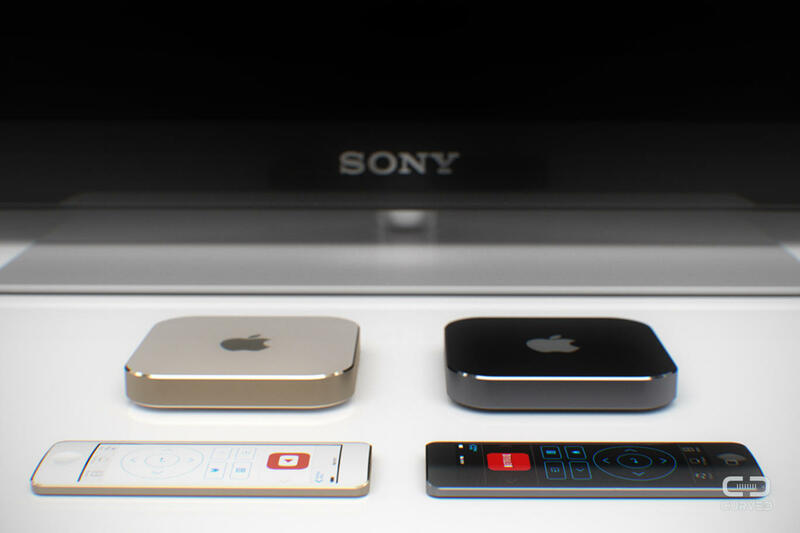 But with a possible “one more thing”…a new Apple TV (finally!) complete with an app store. Also, a possible iPad Pro (12.9” iPad) announcement! This entry was posted in rumors and tagged apple, appletv, ipad, iphone, news, rumor. For years I’ve been annoyed that there was no way to send a voicemail from my iPhone to my wife’s iPhone. With iOS 9, it looks like there will finally be a way! You receive a new voicemail. Open the Phone app -> Voicemail tab. Tap the voicemail you’d like to send and it will expand to show additional buttons. Tap the Share Sheet button (the box with the arrow pointing up). 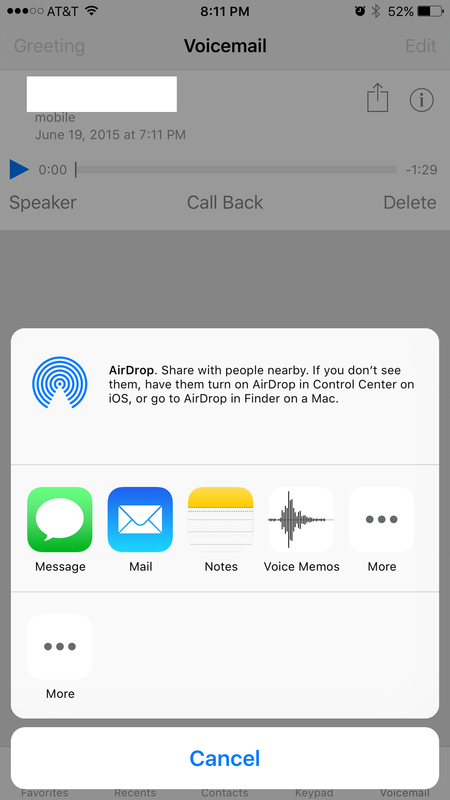 The share sheet opens with options for sending the voicemail as an audio file to Messages, Mail, Notes, Voice Notes, and possibly other Apps. Disclaimer: iOS 9 is only at Beta 1 at this point, so there is a chance it could be removed for the final release, but let’s hope it makes it into the final iOS 9 release! Big thanks to Bearxor on the MacRumors forums for discovering this new feature! This entry was posted in news and tagged apple, breakingnews, ios, ios9, news. 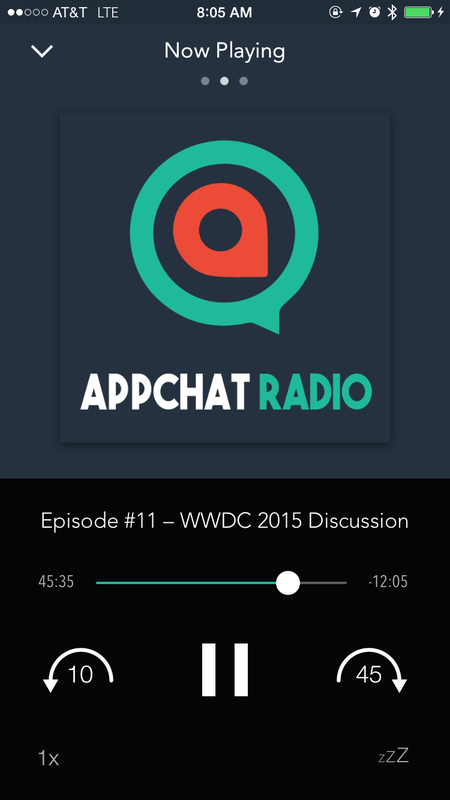 Live on AppChat Radio to discuss all things WWDC 2015! Super excited to be on AppChat Radio to discuss all things ‪#‎WWDC2015‬ with my buddy John! We talk OS X El Capitan, iOS 9, watchOS 2, Apple Music, and more! Take a listen to AppChat Radio Episode 11! This entry was posted in news and tagged apple, applemusic, applewatch, ios, macos, news, osx, watchos, wwdc. 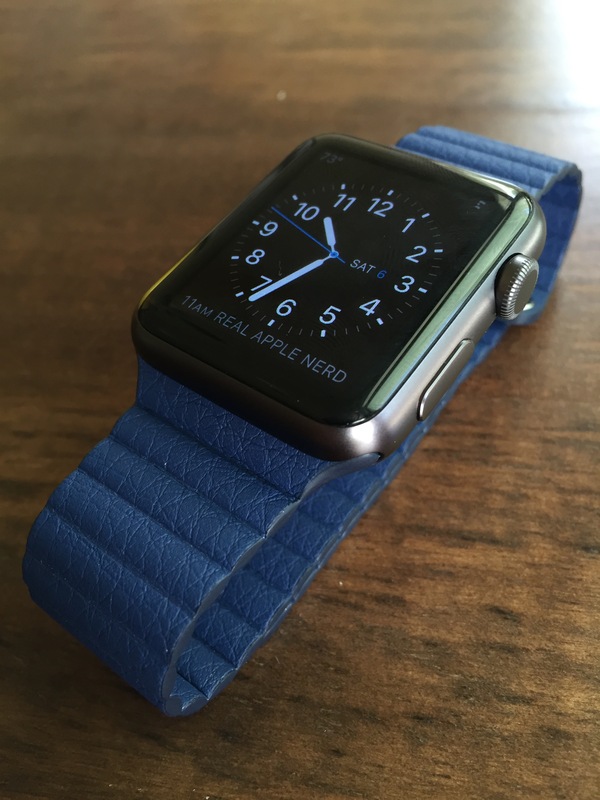 When I first saw Apple’s Bright Blue Leather Loop watch band, I thought it was a unique looking band, but wasn’t sure if it was for me, or if it would look very good with the Space Gray Apple Watch Sport. I was even more unsure of this band when I learned of the price tag ($149.00, which is nearly half the price of the Watch!). 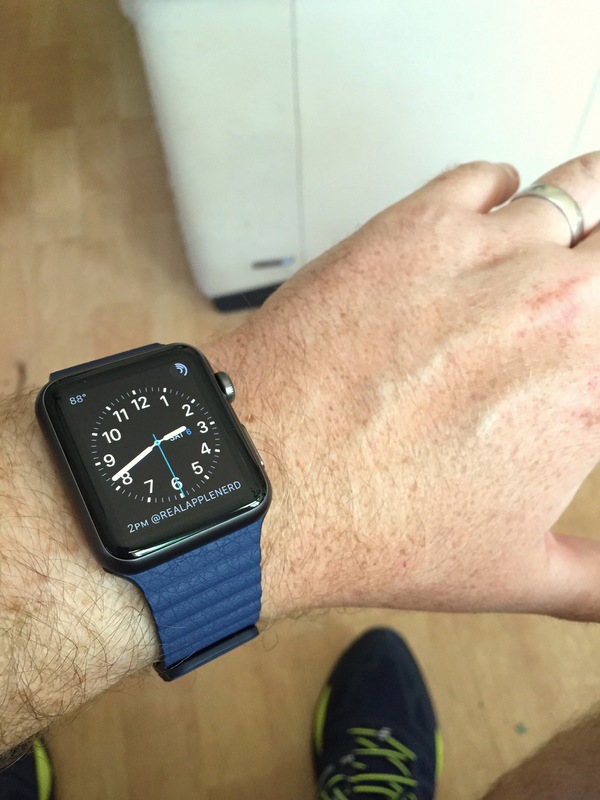 But after wearing the Bright Blue Leather Loop for the past week, I’ve come to the conclusion that this band is like no other out there, and is a great example of Apple’s engineering and design. Plus, it’s just a very cool band and I am highly satisfied with it! The leather has a smooth pebble-like feel, not a soft feel, more like plastic in a way. The firmer feel probably has to do with the magnets encased in a thin layer of leather embedded in the band that make up the closure. There is a rich leather smell when you put your nose up to the band, but the smell has weakened over the past few days. It attaches perfectly to the Apple Watch with no room for play in the connector (compared to the sport band which has a slight amount of play in the connector). The color is a unique rich blue, I wouldn’t call it “bright” blue though. 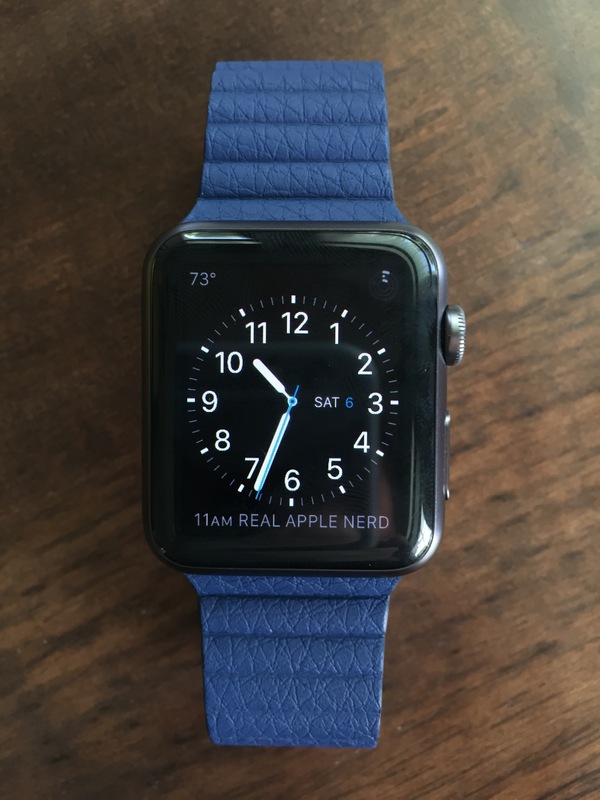 The space gray Watch and the bright blue band form a really neat color combination, that is unique, without being too flashy. 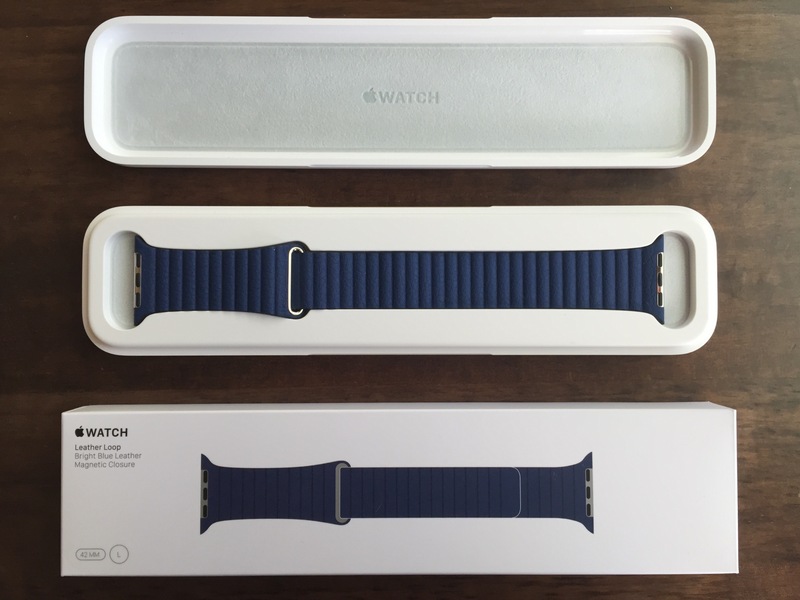 Has a modern and more formal look (compared to the Sport Band). It seems like it came from the future. Magnetic closure allows for infinite adjustments creating a perfect fit for everyone. The magnets feel very strong, but I wonder how long the magnetic strength will last. Locking the band in place provides a satisfying audible *CLICK* as the magnets in the band come together. Sometimes as the band shifts around slightly, it can feel like the Taptic Engine is tapping me on the wrist for a notification, but when I look at my Watch no notifications have come in. Although, after a few days I’ve gotten used to these “phantom taps”, and am able to ignore them. The shipping box is designed with a pull tab that allows it to be opened without a knife or blade. The plastic case that the band rests in is relatively heavy and has a nice quality feel. 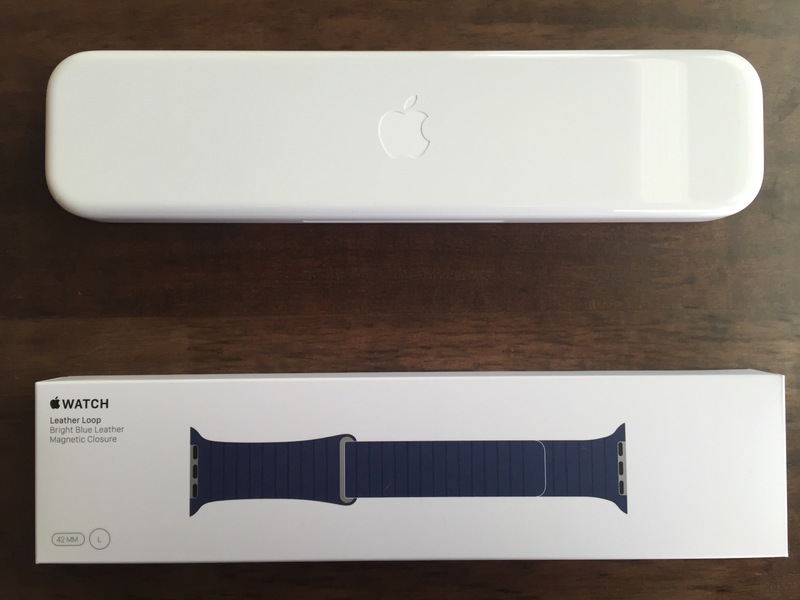 Unfortunately, it will just live in my garage with the rest of my Apple product boxes, until I am ready to sell the band. 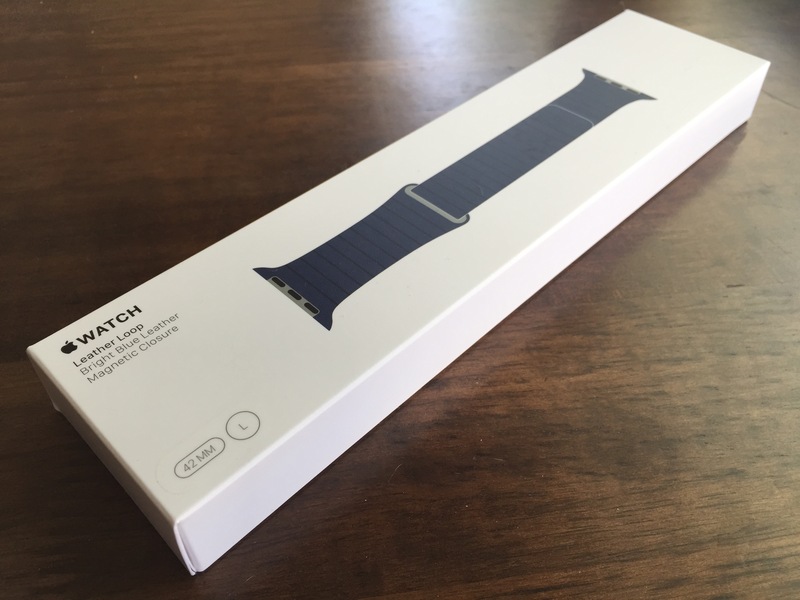 Even though $149 seems like a steep price for just a watch band, it is a very reasonable price when considering that it creates an entirely new look, and is almost like having a second completely different watch. The leather band isn’t waterproof so I have to be conscious about wearing it only when not working out. Luckily, with Apple’s proprietary band connector, I can swap bands in about 10 seconds. I’m not sure if there is any special care for the leather (Apple doesn’t have any leather care recommendations), but I’ve read that using a leather conditioner may soften and protect the leather. I might try Chamberlain’s Leather Care Liniment no. 1 to see how that works. What do you think about this band? Would you buy one? 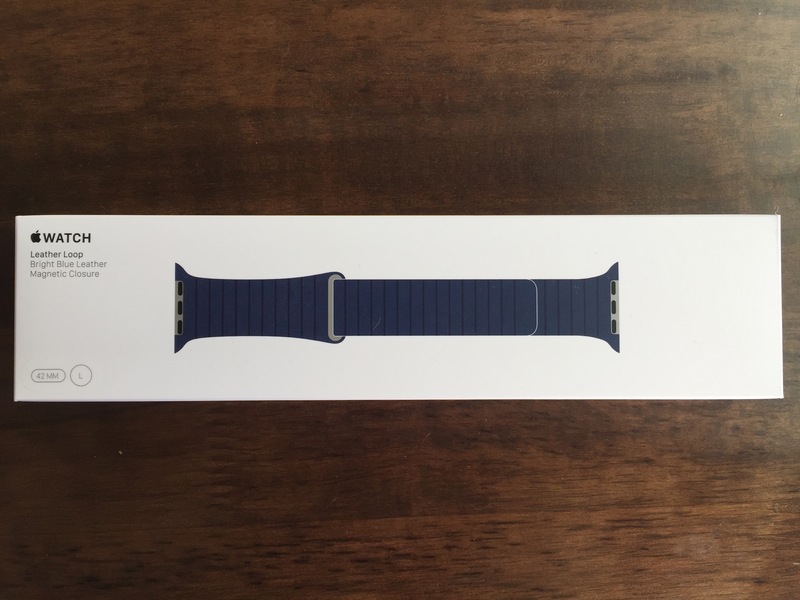 This entry was posted in reviews and tagged apple, applewatch, reviews.